We’ve had some awesome weather this week and today is Cinco De Mayo. This isn’t a clam recipe, but we thought it’d be the perfect recipe to have and celebrate with some Mexican flavor. So fire up the grill and crack a ‘Gansett. This one sure is tasty! Preheat grill. Coat fillets with oil and sprinkle with seasoning. Grill fish over medium heat, about 5 minutes each side. 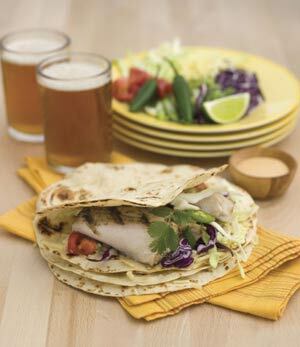 While fish is cooking, warm tortillas on a large skillet or sprinkle lightly with water and warm on grill. Wrap in towel or foil to keep warm. When fish is cooked, break gently into bite-sized pieces, divide among tortillas and top with remaining ingredients. Use the dressing to drizzle over prepared tacos. Best served with a side of black beans and rice.